We’re excited to present an ultra-short guide through IDF’s online learning community – the structure that underpins your learning, your professional growth and your career advancement. Our course structure is very straightforward. 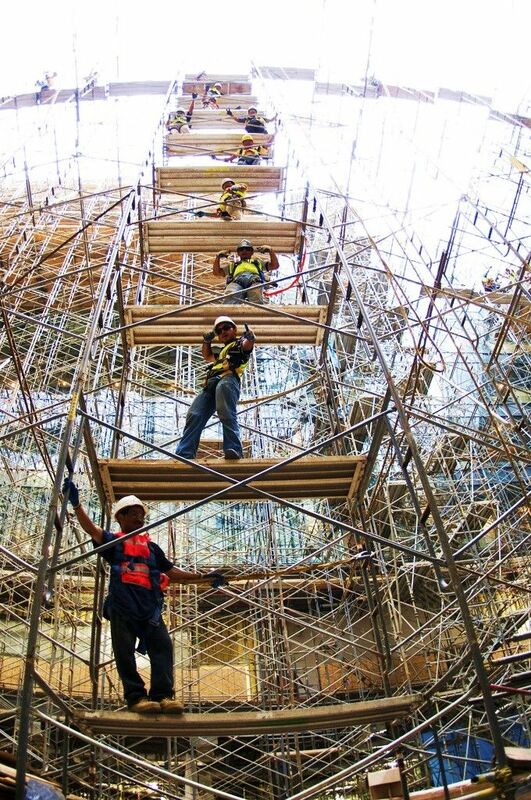 It’s just like a scaffold as a course continuously builds new levels on top of what you’ve just learned while we always make sure that the foundation of your knowledge is strong enough to carry the next level. Our courses are optimized so you can learn efficiently and effectively as well as have fun and meet people of similar interests from across the planet. At the same time, we make sure that courses are self-paced so that you do not get too busy. One day after this “Lesson 0” is released, we’ll release the first lesson of the course. After that, we’ll release one new lesson per week. Each lesson consists of 8-15 individual lesson items, with a test at the end to help you reflect on – and reinforce – the knowledge you have gained from reading, viewing, and listening to each of the lesson items. We appreciate that we humans learn best when information is presented gradually, in small chunks, whilst limiting the number of distractions and the amount of irrelevant information. For this reason, we have designed our lesson items to be “just the right size” so that you are never overwhelmed but can take one step at a time. Some of our courses are purely based on videos. Other courses are purely based on highly illustrated articles. Some courses mix educational videos and articles. We know the pros and cons of all educational styles, and we carefully choose the best-suited educational style depending on each topic. Some lesson items are short and right to the point. Others are long and very complex. We deliberately mix lesson items of different length and complexity so you get deep focus, complexity and in-depth learning on one hand – and you also get easily digestible “information snacking” on the other. Author/Copyright holder: Ursus Wehrli. Copyright terms and licence: All rights reserved. We humans learn best when information is presented gradually, in small chunks. For this reason, we have designed our lesson items to be “just the right size” so that you are never overwhelmed but can take one step at a time. We’ve created a great mix of lesson items of different length and complexity and of videos and articles. Some lesson items are optional, which means that no quiz appears at the end of them. All other lesson items have at least one multiple choice or open-ended question at the end. A multiple choice question consists of a short question followed by three possible answers, and – to state the obvious – you must select the correct option. The multiple choice questions will help test your new insights right away. You will get instant feedback and if your answer is correct, you’ll get points right away. An open-ended question will help you reflect on the topics, principles, and subjects in the lesson and help you gain a deeper understanding. This approach to learning serves to reinforce your memory so you can come to apply your knowledge in your designs – now and in the future. By answering the open-ended questions, you will be retaining information in short-term memory (STM), so it will become enduring knowledge stored in your long-term memory (LTM). Therefore, you will be able to say—with certainty—that you have actually learned throughout the course rather than merely remembered what you have covered. – Benjamin Franklin, who was one of the Founding Fathers of the United States, is widely attributed for this quote, but the quote originates from Xun Kuang, who was a Chinese Confucian philosopher. At the Interaction Design Foundation, we value and prioritize a sense of community. Each course has its own online learning community where you can meet up with peers who are interested in the exact same topic. You’ll be able to engage in your new learning community whenever a discussion arises. Go ahead and ask your co-learners questions, listen to them, answer their questions, and learn from them. They are your learning network, and some of them may even end up becoming your future employers, colleagues, or friends. So, please don’t feel shy, but get the most out of our social learning community. The course discussions are your chance to interact with and learn from like-minded people from all over the world. Your fellow course takers are in the exact same position as yourself in taking this course. This is a great starting point for you to bring up and answer important and interesting questions. Did you know that IDF team members have daily online meetings and discussions, and that they arrange meetings and work camps several times a year to learn, listen, and discuss further? In this picture, a part of the development team is meeting in Thailand. At IDF, we’ve chosen to release a new lesson each week so that you can (more or less) follow the pace of the other course takers. You can move through the lesson items as and when you please (after their release date, of course). You can do assignments and Open-ended Questions at your own pace. Once you have enrolled in a course, you will always have access to the course material, your answers and the discussions. Previous lessons are always available to course participants, no matter what stage they are at down the line. This means relevant information from previous lessons is accessible through a few quick clicks of the mouse button, so you can instantly refresh your memory. Multiple choice questions: You will instantly get points for a correct answer. Each correct answer will usually earn 1-5 points. Open-ended questions: Your instructor will grade the open-ended questions; each answer will usually win you 5-10 points. When your answers are waiting for the instructor to grade them, they will appear as “potential points” on the course progress bar. Discussions: Your instructor will assign 10 points for each group discussion where you engage actively by – for example – uploading a screenshot of a good/bad design or otherwise contributing with quality discussions. Simply adding a short comment will not count. It has to provide educational value to your peers. You will receive your course certificate once you have completed the course, even if after the official end date of the course. You can get your course certificate after having achieved 70% of the total points in a course. However, we suggest you aim higher and try to get the distinction “Top 10% Course Taker” by getting 90% of the total points, or—the “Best in Class” distinction if you get 100%. The distinctions will appear directly on your course certificate. Once you are done with the course, it’ll be time to celebrate, congratulate yourself, and then apply all of your new knowledge in your work.